Well it is Sunday and I’ll be the guest preacher in my Protestant chapel service at the base as I did last week. Since then I’ve been thinking over the week about what it means to be an American Christian at this point in our history. Frankly, based on the words of the pastor of First Baptist Church of Dallas, Texas, Robert Jeffress, I must not be one because according to him Christian critics of Presdent Trump are “irrelevant to Christians.” That may be so and even if it is than I will continue to speak out against the idolatry of Pastor Jeffress and the other proponents of an imperial evangelicalism that is little more than an American version of the German Christian movement that went all in for Adolf Hitler. Pastor Jeffress would be an ideal candidate for the office of Reichs Bishop when President Trump proclaims Evangelical Christianity as the State Church. As for me I say the hell with those who want to establish the bastardized evangelicalism that we know today as the official state sanctioned version of Christianity. For those who don’t think that is likely or possible you are wrong. The words and actions of the President, the Vice President, a number of cabinet members, and many members of Congress all point to this. But worst of all men like Jeffress and most of the leading popular evangelical pastors and evangelists in the county are working toward that end and the day that it finally happens is coming sooner than you think. A minority of Christians who are better at making former Christians, agnostics, and atheists than disciples of Jesus want nothing more than to gain political power and are willing to use the most base and unchristian President in recent memory as their vehicle to temporal power. Sadly, Goldwater was right. Jeffress and others want no more than to use the power that they have with President Trump to rule with an iron fist that is no different than that of the Taliban, and no no different than the inquisition. It is time for people who actually believe in the sacred principles embodied in the Declaration of Independence, the Bill of Rights, the Gettysburg Address, the Four Freedoms, and the I Have a Dream speech to stand. It does not matter if you are a Christian, a Jew, a Muslim, a Hindu, Buddhist, Wiccan, agnostic, atheist, or Free Thinker, or for that matter anything except being an American that cherishes liberty for all. President Trump has recognized the same thing and with the help of the vast majority of American Evangelicals he is doing the same thing as Constantine and men like Robert Jeffress are to vain and power hungry to understand that they are sealing the doom of the Christian faith in the United States. That is why I will not stop writing, not stop speaking, and not stop fighting. I may be to use the words of Jeffress an insignificant and irrelevant gnat to him and the President but I’ll be damned if I let men like them use Jesus as a vehicle for tyranny. I’ll be damned when I let a political preacher like Jeffress stand on the same platform as the President and use it to condemn fellow Christians. 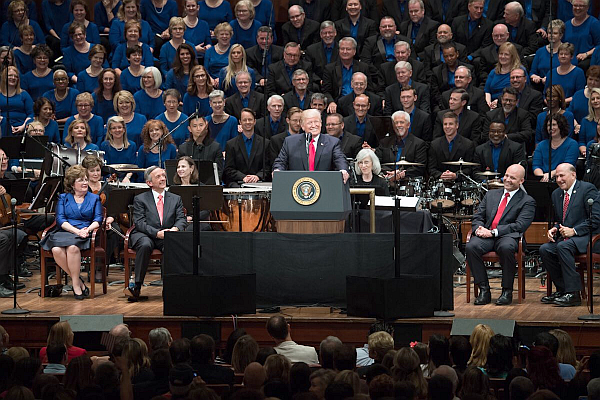 as his very own church choir debates a hymn entitled Make America Great Again, a song which is a hymn of praise not to Jesus but to the nationalistic jingoism of President Trump. His predecessor in the pulpit of First Baptist, George Truett would be dismayed by the actions of the man who now holds that pulpit. Likewise our nation’s founders would be dismayed but not surprised to see this going on. Many wrote about the danger of it and did their best to build up a wall of separation, but that wall is being dismantled before our very eyes. When it is gone we will all regret it, and yes by all I even include the Evangelical Christians who now worship at the altar of Robert Jeffress and Donald Trump. I really dont know the answer to my question so that is why I am asking you. Last week, my family and I went to Philadelphia, New York, Boston and Plymouth for our summer vacation. Of course the kids wanted to go to a beach but this trip was for them to have seen the places that they study in school. Anyway, I had no idea that the American Revolutionaries were so entwined in the faith of Christianity. Most everything that spurred them on was based on sermons from the Pulpit. Paul Revere had a pew box up front in the North Main Church. Christ Church in Philadelphia was a prominent meeting place for the most important people in our history. Now I totally agree with you about everything you write about today’s Christian influence on the political process but I have wondered all week if this isn’t something new but it is a unsavory part of our American DNA? Good quest and observation but the fact is that if you read the accounts of the signers of the Declaration and their writings, very little came from the pulpit. Of the signers only one was a clergyman and most even if they had a church affiliation most would not be considered Christians today. Most were Deists and Free Thinkers, and their philosophy came more from Locke and Voltaire than the Bible. There were a few influential pastors who were revolutionaries but they, contrary to myth were in the minority as the vast majority of pastors played it safe on the sidelines either as neutrals or Tories. That being said the country, until the massive immigration of Catholics in the mid to late 1800s ensured that the country was at least culturally Protestant. That influence had some good things regarding literacy, schools, and charitable hospitals and orphanages. Some in the North, mostly more liberal Protestants were involved in the abolition movement. However, once the Cotton Gin was invented Southern Evangelicals who had considered abolished slavery rapidly embraced it with a fervent theology that both defended it and the proposition that blacks were less than human. Christians in the North and South both embraced the worst aspects of Manifest Destiny, the dismemberment of Mexico, the extermination of Native Americans, while Southern Christians sought to expand slavery to the west, supported the Fugitive Slave Act of 1850, and sought to expand slavery to Cuba. The influence of Christians from the time of the Revolution to today is a mixed bag. There is much influence, and while some was in the spirit of the Revolution and in keeping with both the preamble of the Declaration and Constitution, much of it is to be frank the worst of what the founders were trying to escape. That continues today. And this is exactly why I ask the dumb questions to smart people like you. I am glad to know that they really meant it when they said there should be a separation between Church and State. Not a dumb question, at least you asked me and not David Barton. A heartfelt Amen to what you have written. What you describe I saw this happening during the election where Ronald Reagan got President. At that point I was already interested in. American Elections; which may sound strange because I’m a Dutch citizen. But for us it’s important to do so. What did made me shiver were the “righteous reborn Christians” that wanted their opinions, their rigid religious views the standard for the USA. You did quote Americans of the past. This fusion of church and state is something the US has seen before. Why the American flag and/or state flag has a place in a house of prayer? Why, like you did in this post, write about American Christian? In my view I’m a Christian first and a Dutch citizen second. A small detail maybe but it represent a different ethical point of view. Why almost every American President, politician, everyone else giving a pcublic speech ends the speech with: God bless the United States of America? glued something together what should have been seperated. Hey Marie. That was something I also noticed. The American flag standing close to the pulpit in American churches. Not something we have in the UK. Good points you made. Thank you. A fake pastor worshipping a fake president. So hypocritical.